In addition to its city hall with parts dating from the 16th century, and the picturesque half-timbered buildings, Rhens has a rather unusual historical monument. 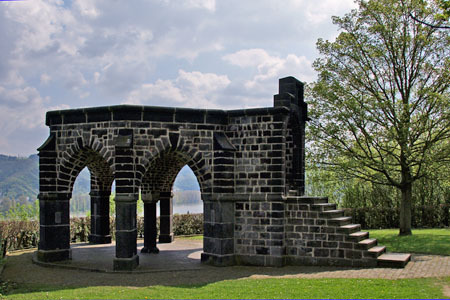 It is the six metre high stone "King's Throne" or "Königsstuhl" located upon a small hill ("Schawall") on the Rhine. It has an important place in the history of this small town. It is here that the seven electors (the archbishops of Cologne, Trier and Mainz, as well as the electors of Kurpfalz, Brandenburg, Saxony and Bohemia) prepared for the election of the Emperor in 1273, meeting in a nut tree garden. They chose Rudolfs of Habsburg (1273), Heinrichs of Luxemburg (1308) and Ludwig of Bavaria (1313/1314). Due to increasing tension between the Emperor Ludwig of Bavaria and the Curia of the Pope in Avignon the electors (except King Johann of Bohemia) united as "The Electoral College at Rhens" (Kurverein zu Rhense) on the 16th of July 1338. They decided that only a majority of electoral votes should determine the legitimate ruler of the Holy Roman Empire and its associated titles, and that this election would be independent of Papal agreement. This had widespread political consequences. It was an important step in defining and establishing the constitutional rights of the Electoral College in the medieval German Empire. In 1356 this decision was supported and strengthened by the so-called "Goldene Bulle". The King's throne of Rhens was rebuilt between 1376-1398 by the former Emperor Carl. It was made from black lava cuboids according to a model of the former wooden construction. The middle column is made of basalt. This impressive artefact was used for the official crowning ceremony of several German Kings and Emperors. The throne was destroyed under the French regime in 1795, but rebuilt in the Romantic era. The throne has been in its present location above Rhens overlooking the village and the Rhine since 1929. In past decades the mayors of Koblenz and Rhens met at this historical site several times, for the "Bürgermeistertreffen auf dem Königsstuhl" (=the Mayors meeting on the throne). On the other side of the Rhine lies Marksburg (the name is derived from St. Mark). Its position upon a high cliff above Braubach renders it difficult to reach. It is the only mountain castle in the middle Rhine area that has survived so many wars undamaged. These began with the Thirty Years War and lasted up to and including the wars in the age of the French Revolution. However, in 1900 the natural decay had progressed so much that the German castle association authorised a total restoration to save the castle. Today it once again an impressive medieval fortification attracting thousands of tourists every year. The Knight's hall containing polished and shiny armour and weapons of the past 100 years is worth a visit. A particular attraction is the authentically restored fortress chapel, with its medieval painted arched roof.